Maserati and Alfa Romeo may get their first SUVs using the Grand Cherokee platform. Fiat S.p.A.'s Maserati and Alfa Romeo brands may get new SUVs derived from the new Jeep Grand Cherokee platform, CEO Sergio Marchionne said. The latest Grand Cherokee platform -- developed with Mercedes-Benz, which is owned by former Chrysler parent Daimler AG, -- can handle more powerful powertrains, Marchionne added. The new models could debut in 12 to 18 months and most likely would be assembled at Chrysler's Jefferson North assembly plant in Detroit, he said. Marchionne said a large Maserati SUV based on the Grand Cherokee architecture could be powered with a Ferrari-built engine. Ferrari assembles the 4.2-liter and 4.7-liter V-8 engines used in current Maserati passenger cars. Alfa Romeo and Maserati have never sold an SUV before. As part of its alliance with Chrysler, Fiat is preparing to reintroduce the Fiat brand in the U.S.market late this year, followed by the return of Alfa Romeo. Fiat's business plan, unveiled in April, called for Alfa to add two all-wheel-drive crossovers: a compact-sized model in 2012 and a mid-sized model in 2014. Both of the vehicles will be built by Chrysler in the United States and sold worldwide by Alfa. 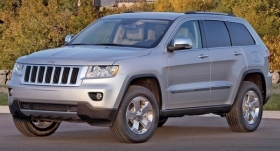 A Fiat spokesman said the Grand Cherokee-based SUV could be an additional model in the Alfa range. Maserati's latest business plan, also unveiled in April, did not include an SUV. A Maserati spokesman confirmed the project is in the works and could be launched in 12 to 18 months. It's unclear what additional Chrysler Group models are being considered. The redesigned 2011 Dodge Durango also shares the same platform as the new Grand Cherokee. The Durango features three rows of seating and goes on sale later this year. The previous-generation Durango shared the same platform as the short-lived Chrysler Aspen SUV. And a stretched version of the previous Grand Cherokee platform was used to underpin the Jeep Commander SUV, which featured three rows of seating.